The lack of household food stocks, sharp reduction in seasonal income, and inadequacy of food assistance programs will expose poor households in central and southern areas of the country to Crisis (IPC Phase 3 and 3!) levels of food insecurity between July and September. While better pastoral conditions and crop production are expected to improve their food access in the next few months, poor households residing in the areas mentioned above will still face Stressed (IPC Phase 2) food insecurity between October and December. The repayment of debts, depletion of livestock herds, and end of humanitarian assistance programs will limit the impact of seasonal gains during that period, helping to drive elevated levels of food insecurity. Unlike in urban areas, prices for livestock in rural areas are down sharply since June. The poor pastoral conditions triggered atypically large animal sales, which was further exacerbated by the practices of livestock traders. Consequently, poor pastoral households currently facing livelihood protection deficits will continue to face Stressed (IPC Phase 2) food insecurity through September. Due to average seasonal rainfall forecasts, pastoral conditions and rainfed crop harvests are expected to be favorable between October and December. As a result, food security outcomes for poor households in areas currently facing Stressed (IPC Phase 2) food insecurity will improve to Minimal (IPC Phase 1) levels. 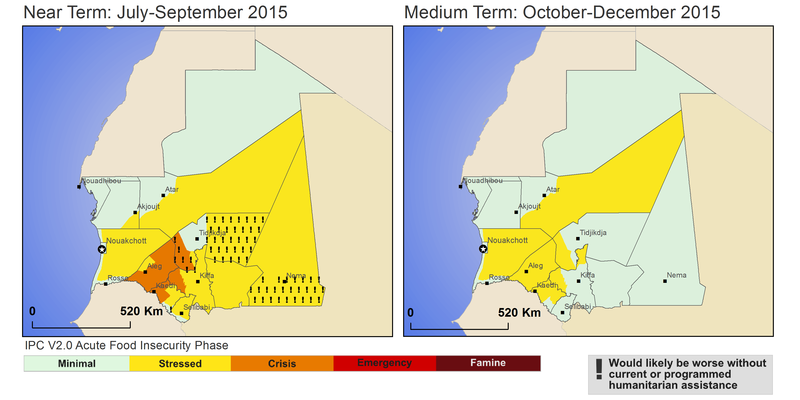 This map shows current relevant acute food insecurity outcomes for emergency decision-making. It does not necessarily reflect chronic food insecurity. Farming: Despite reported rainfall activity, the only rainfed farming activities underway are in the southern reaches of the rainfed farming zone (along the Malian border), with farmers preferring to wait for the departure of transhumant herds and see the results of their dry-planting efforts before engaging in any wet-planting activities. The FAO and the Mauritanian government have distributed 479 metric tons of cereal seeds to 8050 households across the country. The growing season for irrigated rainy season crops in the Senegal River Valley is underway but, with the limited access to farm credit on account of the nonpayment of water charges from 2014, there are much smaller areas currently planted in crops compared with the same time in 2014. The date harvest in oasis areas is in progress. Though date production is down from 2014 and below-average, households are already generating larger seasonal incomes from these crops than at the same time in 2014 due to the sharp rise in the price of dates (with high-quality varieties selling for 1200 to 1500 MRO/kg, compared with 800 to 1200 MRO in 2014), fueled by the heightened demand during Ramadan. As usual, there are no farming activities underway at this time in other livelihood zones. Pastoral conditions: Seasonal pastoral conditions in most areas of the country are poor and the only pastures still meeting the needs of existing livestock herds are in the north, where the average levels of rainfall in 2014 produced only enough new usable pasture growth for camel herds able to go several days without water. While it normally meets year-round livestock needs, the deterioration in the condition of pastures in areas along the Malian border with the largest concentrations of transhumant Mauritanian livestock herds is so severe that pastoralists are resorting to the use of animal feed and sorghum crops from Mali to feed their cattle and sheep. Even with the pastoral assistance program centered around the sale of 30,296 metric tons of animal feed at subsidized prices (3500 MRO for a 50 kg bag of feed) to a target group of approximately 117,220 pastoralists, prices on formal markets have been steadily rising since April, though at a somewhat slower rate since the start-up of this program in May. Current prices for animal feed are between 7000 and 9000 MRO compared with 3800 to 6000 MRO at the same time in 2014. With the shortage of pastures and their inability to afford animal feed to maintain their animals, poor and lower middle-income pastoralists are continuing to sell livestock to traveling livestock traders offering low prices, which they are forced to accept on account of their distance from retail markets (except for those in the southern reaches of the rainfed farming zone). Thus, a sheep for sale on the Ould Yengé market in a rural pastoral area in northern Guidimakha is currently worth only 14,000 MRO, compared with its normal value of around 20,000 MRO at the same time in an average year. Seasonal income: The lack of local seasonal activities in the southwestern reaches of the Senegal River Valley (where rainfed farming activities have not yet started up) is limiting incomes in that area. The only currently active sources of seasonal income in many livelihood zones are livestock sales (by households with remaining animals) and migrant remittances from short-term seasonal labor migration. However, migrant remittances are only about 25 to 30 percent of average this year as the atypically large number of migrant workers has heightened competition for the limited number of employment opportunities. However, in some municipalities, limited household income levels are being bolstered by monthly cash transfer payments by the WFP and certain NGOs (Save the Children, OXFAM, ACCORD, etc.) to 69,700 and 92,334 households, respectively. These payments are spread over three to four months and range from 15,000 to 22,000 MRO, except in areas also targeted for distributions of free food assistance, where transfers are reduced to 12,000 MRO. Markets and prices: Retail markets are still well-stocked with imported staple foodstuffs. Unit prices for wheat, the main imported substitute cereal, range from 125 to 170 MRO/kg, depending on the area and have been stable for the last three months. In addition, wheat prices are slightly below the five-year average, except in the agropastoral zone where ongoing social reforms have heightened demand for wheat, which is easier for women to prepare than sorghum. Nutritional situation: UNICEF and the Ministry of Health conducted a SMART nutrition survey of 12,736 children between six and 59 months of age in all parts of the country over the period of June 4th to June 26, 2015. According to the preliminary survey findings, 14 percent [13.0 – 15.0] of this group of children between the ages of six and 59 months were suffering from global acute malnutrition (GAM), indicating a rise in the prevalence of GAM compared to both last year’s lean season (9.8 percent) and the lean seasons of the past five years (between 9.8 and 13.1 percent). This also exceeds WHO’s critical GAM threshold of 10 percent. The departmental breakdown shows rather troubling rates of global acute malnutrition in Amourj and Kankossa in June which, according to preliminary figures, exceeded 20 percent and were well above figures for 2013, the only recent year for which there is SMART survey data available. The mortality rate for children under five was not especially high in Kankossa, but was estimated at 1.04 [0.73 to 1.47] in Amourj, compared with 0.13 [0.02 to 0.99] back in 2013. Food assistance: According to the general response plan as of April 27, 2015, 524,165 people are targeted by 2015 food assistance programs (cash transfer programs or distributions of food rations) mounted by the CSA (the national Food Security Agency), WFP, FAO, and various NGOs (Oxfam, Action Against Hunger-Spain, Save the Children, GRET, IOM, and ACCORD). These programs will improve food access for program recipients in service areas in Assaba, Brakna, Gorgol, Guidimagha, Hodh Echarghi, Hodh El Gharby, and Tagant. Rainfall: There are conflicting seasonal forecasts for the period from July through September, with some forecasts (by NOAA and PRESAO/ACMAD) predicting average to above-average conditions while others show a higher probability of below-average rainfall (forecasts by the ECMWF, IRI, and UK MET). In view of this uncertainty, FEWS NET is assuming that most farming areas of the country will get average levels of rainfall between July and October and will have a normal end-of-season in October. Crop production: After two consecutive years of low rainfall, there are above-average numbers of workers engaged in short-term seasonal labor migration. There is a high likelihood of large cutbacks in the land area planted in crops on account of the reduced presence of farm labor (with migrant workers still in destination areas waiting for the start of the rainy season to return to the land), problems with access to credit, and the heavy pressure from transhumant livestock on croplands that also serve as pasture. Long-cycle crops will be ready for harvesting starting in October. Date production: Though there will be a smaller than average volume of date production in northern (Adrar) and central areas of the country (Tagant, Assaba, and Hodh El Gharbi) on account of water shortages, it will generate a larger stream of income between June and August (from sales of fresh dates) and after September (from sales of dried dates) than in 2014 due to the sharp increase in producer prices for dates (to between 1200 and 1500 MRO/kg). Farm income: The outlook for an average rainy season points to near-average to slightly above-average levels of farm income in most farming areas. However, the likely downsizing of cropped areas in irrigated farming schemes will likely reduce income from these activities. Pastoral conditions: Conditions did not start to improve until the definitive start of the rainy season (in mid-July) and will not reach optimal levels until August, assuming there are no protracted dry spells. The new green pastures, however dense or sparse they may be, will help limit the use of animal feed by pastoralists and curb livestock sales as part of coping strategies between July and December. They will improve the physical condition of livestock, helping to drive up their prices and strengthen their reproductive capacity. The next round of new births and main milk production period will begin six to seven months from the sprouting of solid new pasture growth, or after the end of December. Wage income from pastoral work: As usual, the improvement in pastoral conditions with the beginning of the new rainy season will limit the use of pastoral labor and reduce the amount of income from this type of work in all pastoral areas between August and December. Food imports: There will be regular adequate imports of different foodstuffs (rice, wheat, sugar, oil, etc.) during the outlook period to meet domestic consumption needs and for re-export to Senegal, Mali, and the southern Maghreb, where the sale of these commodities and of manufactured goods serves as a source of foreign exchange. Livestock markets: There will be low supplies of animals on livestock markets in pastoral areas in the central, western, and northern reaches of the country due to transhumant herd movements and the depletion of sedentary animal herds (a large part of which were sold off to meet the food needs of households and livestock or decimated by food shortages). Supplies will become increasingly tight with the gradual onset of the rainy season, spurring the growth of new green pasture and allaying the fears of pastoralists. The situation in all pastoral areas other than in the rainfed farming zone, where the condition of pastures is still more or less acceptable and where there should be more or less normal reproductive cycles, will be typical of any post-crisis period in rural areas when, after losing a large part of their herds, pastoralists stop selling animals in hopes of rebuilding their herds through new births. Wild plant products: With the start of the rainy season in July, wild plant foods (mainly leaves) will be present at local markets by the third dekad of that month, helping to reduce demand for other imported foodstuffs (milk, pasta, etc.) Between October and December, the spin-offs from an average rainy season should translate into average yields of edible wild fruits and seeds, helping to bolster the incomes of poor households gathering these wild plant products with a view to selling them on local markets or to collectors for shipment to Nouakchott and export. Cereal prices: Unlike the case in an average year, when the tightening of supplies will normally drive sorghum prices steadily upwards throughout the lean season (between May and August), there should not be any steep increases in prices this year on account of low demand, with households turning to less expensive foods (such as wheat) and ongoing humanitarian assistance programs. The downward trend in prices since March should continue and, barring a disruption in assistance programs or shock to world market prices for wheat or wheat supply chains, prices for this commodity should remain stable through September, at which point they should begin to decline with the expected average yields of rainfed cereal crops (particularly sorghum). Prices for imported foodstuffs (rice, wheat, and processed food products such as oil and sugar) will rise in line with normal seasonal trends, though any price increases will be limited by the good availability of substitute cereals (wheat, locally grown rice, and maize from large re-exports by Mali, Senegal, etc.). Livestock prices: There will sharp increases in average market prices for livestock in local seats of government compared with June levels, fueled by demand for two consecutive religious celebrations (Ramadan in July and Tabaski in October) and the tightening of supplies with the beginning of the rainy season. Price increases will be smaller in rural areas, where pastoralists will remain subject to the dictates of traveling traders. Migrant remittances: Once the rainy season settles in, migrant workers will return home to work the land in August. The lack of jobs in destination areas for migrant workers will accelerate the flow of return migration, which is generally spread out over time according to the pattern of rainfall. This is expected to accentuate the reduction in migration income even more than usual, which is currently already at less than 25 percent of the average. Debt: The current above-average levels of debt, driven by low seasonal incomes and the heightened dependence on food purchases, will remain unchanged until the upcoming September harvest. This will affect future income from farm labor (as well as income from short-term seasonal labor migration and humanitarian assistance programs), which will be used to pay off debts between July and September. Normally, these debts are repaid from crop yields between November and December, after the harvest of higher-yielding long-cycle crops. However, when very large debts are incurred, as is the case this year, traders require partial payments from harvests of short-cycle crops. Thus, a good portion of the short-cycle crops scheduled to be harvested at the end of September will be used to pay off debts. Assistance programs: There are several assistance programs (distributions of food rations and cash transfer programs) mounted by the government, the WFP, and NGOs scheduled to run through at least the month of September in the areas of intervention shown in Figure 4. In addition, based on figures for the target population in the response plan released in April 2015, FEWS NET is assuming that at least 50 percent of very poor and poor households in Amourj, Bassikounou, Djigueni, M’Bout, Monguel, Moudjeria, Nema, Tibedra, and Tichit departments will be served by humanitarian assistance programs meeting at least 20 percent of their energy needs. Ongoing programs in existence for several years such as village-level food security stocks (SAVS), government-subsidized “boutiques de solidarité” (BS), and outpatient therapeutic feeding centers (CRENAM) will continue through December. With the current level of information on departmental and municipal coverage rates for these assistance programs, it is difficult to determine their exact level of impact. While acknowledging that they do exist, it is safe to assume that they are still too limited and unevenly distributed in time and space to have any significant positive effect on prevailing food insecurity levels since the month of June, except in the specific areas referred to above. Community self-help: This refers to local (with the extended family and village community) and outside ties of mutual assistance (with relatives in other livelihood zones or working in urban areas with more or less regular incomes). The current extremely active and above-average flow of both types of assistance is expected to continue until the upcoming main harvest season (between September and December). It is to this end that cash transfer payments and food rations furnished by assistance programs are also assumed to be shared by all poor households within the community. Between July and September 2015, poor households in Brakna, southwestern Tangant, western Assaba, and northern Gorgol with large shortfalls in their cereal production and annual 2014/15 incomes will try and cope by upping their consumption of less expensive foods sold in “boutiques de solidarité” at subsidized prices (wheat and locally grown rice), selling any remaining animals, skipping meals, and sharply cutting back their food intake. Their food consumption gaps will also be a factor in keeping global acute malnutrition rates close to or slightly above their June 2015 levels, which are well above GAM rates in previous years and WHO’s 15 percent crisis threshold. While their food deficits will be more or less stabilized by ongoing distributions of free food assistance and cash transfer payments in certain areas, these households will still be in Crisis (IPC Phase 3 and 3!) through September 2015. In addition, there is a high probability of extremely large food consumption deficits, propelling certain very poor households (less than 20 percent of the population of affected areas) into an Emergency (IPC Phase 4) situation, if only between July and September. These households will have to wait for pastoral conditions to improve and for new supplies of crops (edible leaves, short-cycle sorghum and cowpea crops, and, in particular, harvests of long-cycle crops generally beginning in October) for any hope of even partially covering their current food consumption deficits. However, this improvement could be slowed by the adverse effects of certain negating factors (such as the repayment of debts, the depletion of livestock herds, the suspension of assistance programs as of the end of September, etc.) While global acute malnutrition rates will likely come down and there will be an improvement in current food security outcomes, households will continue to have difficulty meeting their basic nonfood expenses and, thus, will face Stressed (IPC Phase 2) food security conditions through December. All groups of pastoral and agropastoral households currently in Crisis (IPC Phase 3) food insecurity will eventually improve to Stressed (IPC Phase 2) levels between July and December with the help of humanitarian assistance (the pastoral assistance program, distributions of food rations, and cash transfer programs) and with improvements in pastoral conditions. There will be no change in the currently Stressed (IPC Phase 2) food insecurity in certain predominantly pastoral livelihood zones between now and September, or until there are good pastoral conditions to bolster yields from rainfed crop production. As of October, food insecurity in these areas will gradually come down to Minimal (IPC Phase 1) levels with the positive effects of harvests of long-cycle crops in October/November, better pastoral conditions, and incomes from livestock-raising activities strengthened by the physical recovery of livestock and their resulting higher market value.